On fire: Big Bash star Lauren Cheatle helped the Ghosts women win their T20 clash on the weekend. Two tremendous T20 wins by the Campbelltown Camden Ghosts women’s and men’s first grade teams on the weekend were punctuated by a brilliant individual performance in each of the games. 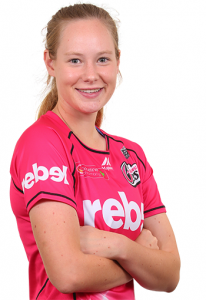 As JASON ELLSMORE reports, women’s Big Bash star Lauren Cheatle smashed 39 runs off 16 balls, including eight boundaries in the big win over Universities. Cheatle will be one of several Ghosts women who will figure in this season’s Big Bash competition. 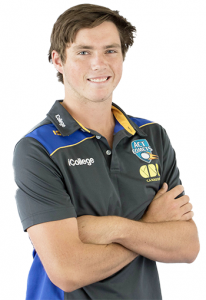 Young bowler Sam Skelly was in the groove in the men’s T20 match on Sunday, taking the club’s 22nd hat trick to destroy the Blacktown top order. Skelly ended up with 4/11 off his four overs, with the victims being Blacktown’s top four batters. The victory means the Ghosts are well on the way to qualifying for the final series of the Kingsgrove T/20 Cup, having been unbeaten in preliminary matches so far. On the weekend against Blacktown the Ghosts completely outplayed their hosts. Losing the toss and finding themselves in the field, the Ghosts bowlers reacted straight away, with Sam Skelly leading the way. Skelly’s hat trick came off a tidy caught behind for wicket keeper Ollie Robinson, a brilliant diving leg side catch to skipper Jarrad Burke at short fine leg and then an outstanding third delivery to rock back the top of off stump. Not long after his hat trick, Skelly knocked over the leg stump of Blacktown prize bat Matthew Day for his fourth scalp of the day. Skelly was well backed by the other bowlers and superb fielding as Ghosts restricted Blacktown to 96 runs. Luke Webb capped off a good weekend taking 3/22, Tanveer Sangha was economical continuing his success with 1/14 off four overs and skipper Burke enjoyed his day with 1/25 and two fine catches. In reply, the Campbelltown Camden batting was clinical as they passed the Blacktown score inside 14 overs. Premier batsman Phil Wells returned to form to remain unbeaten for 32 runs, Jake Cormack struck four boundaries in his brief but effective innings of 23, while Ben Patterson, the Ghosts NSW Country import from Dubbo, demoralised the Warriors bowlers with a punishing 25 not out off 14 balls. Coach Jeff Cook was impressed with the Ghosts effort. “It was good reward for a team who turned up with a good attitude,’’ Cook said after the match. “The fielding was first class, we batted well but to knock over any side in this comp for less than a hundred I’d like to think you don’t lose too many. Rising star: Sam Skelly took four wickets, including a hat trick, to guide the Ghosts to an easy win over Blacktown on Sunday. The Ghosts men are now well placed in their quest to play in the prestigious final on the Sydney Cricket Ground and represent NSW in the Australian T/20 Premier Club Championships. The Ghosts men’s brilliant T/20 victory was matched by an equally impressive win by the Ghosts women’s first grade team. Traveling to Daceyville to take on the Universities side, the Ghosts hammered 168 runs off their 20 overs. The highlight of the Ghosts innings was Lauren Cheatle’s innings of 39 off 16 balls. Cheatle smashed eight boundaries as Hannah Darlington (30), Clara Iemma (26) and Yardley Polsen (23) helped build the massive total. All the Ghosts ladies bowled well to restrict the Uni bats, who could only manage 5/74. On Saturday, day two in the Sydney Premier Cricket clash with Gordon at Raby, the Ghosts were defeated, with night watchman Luke Webb’s 49 runs the only resistance to the visiting bowlers. One bright spot was young leg spinner Tanveer Sangha, who completed a good match by scoring an undefeated 24 to add to a five wicket haul a week earlier. The Ghosts next match sees them at Bankstown this Saturday, December 1 for round seven of Sydney Premier Cricket.